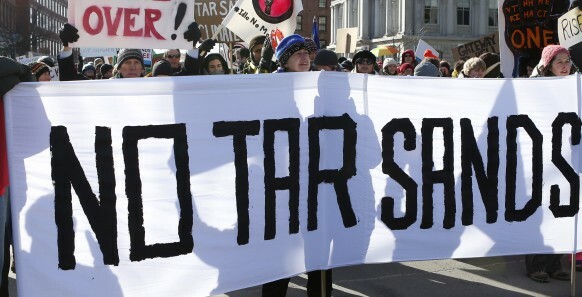 The movement to oppose Keystone XL is huge in Canada. It ranges from activists and scientists to indigenous peoples of the threatened Canadian plains and boreal forests, where the tar sands are located. It includes rural farmers and ranchers, and important sections of the labour movement. Dave Coles, President of the Communications, Energy and Paperworkers’ Union, spoke to 5000 people on Oct. 23, 2012, at the Defend Our Coast rally in Victoria, British Columbia, explaining why his members are “diametrically opposed” to Tar Sands pipelines that would extend to BC’s coast. A representative of the United Fishermen and Allied Workers echoed those concerns, citing the loss of fisheries jobs in Alaska following the Exxon Valdez oil spill. Most recently, the December-January upsurge of popular solidarity with aboriginal rights, voiced in part by the Idle No More movement, targeted federal government legislation to eliminate federal protection of lakes and waterways. Rallies held across the Canadian state also opposed pipeline construction to transport Alberta crude to China and other destinations. Opposition to XL unites everyone to the left of the Stephen Harper Tories. Where the unity fractures is over energy alternatives. Sadly, the labour-based New Democratic Party federal leader Thomas Mulcair argues for building a pipeline eastward to deliver the tarry fuel to Atlantic Canada, at a cost of billions, rather than invest the money in green energy options—climate change be damned. Protests in Canada dovetail with actions against the construction of oil pipelines in the United States. The most significant project is the Keystone XL pipeline, which would carry Alberta tar sands petroleum 1700 miles through environmentally sensitive areas of the Midwest to refineries in Texas. In January, hundreds of Native Americans, including supporters of Idle No More, gathered at the state capitol in Lincoln, Nebraska, to oppose the line, pointing out that it would endanger their ancestral lands. On Jan. 26, some 1400 marched in Portland, Maine, to protest a proposal to move tar sands oil via a pipeline through eastern Canada to ports in New England. And on Feb. 17, tar sands and the pipelines will be a major focus of the Forward on Climate mass rally in Washington, D.C. The U.S. State Department is expected to release its Environmental Impact Statement on the Keystone XL pipeline very soon, and the Obama administration will make its decision on the project later this year. According to Oil Change International, emissions from tar sands extraction and upgrading are between 3.2 and 4.5 times higher than the equivalent emissions from production of conventional oil in North America. On a life cycle basis, the average gallon of tar sands bitumen-derived fuel embodies between 14 and 37 percent more greenhouse gas emissions than the average gallon of fuel from conventional oil. Reasons to oppose pipelines and bitumen extraction do not stop there. Do you know the story of petcoke? It’s a leftover from refining tar sands bitumen. Petcoke is sold as coal, but since it is cheaper and dirtier, it helps keep coal-fired plants running and polluting our atmosphere. A ton of petcoke yields, on average, 53.6 percent more carbon dioxide than a ton of coal. The proven tar sands reserves of Canada will yield roughly 5 billion tons of petcoke—enough to fully fuel 111 U.S. coal plants to 2050. The situation is critical. That is why socialists say: No to tar sands oil! No to the pipelines! Nationalize Big Oil under workers’ and community control. To combat climate change, governments should radically reduce reliance on fossil fuels, and implement a systematic plan for the development and use of sustainable green energy alternatives. > The article above is by Barry Weisleder, and is reprinted from Socialist Action newspaper.